Inspector Debbie Williams has served in all districts across the state in a large variety of roles during her 27-year career. She was the first Tasmania Police Fire Investigator, the first female officer to be stationed at St Helens and the first female Station Sergeant at both Devonport and Ulverstone. She credits this diversity for giving her the experience and skills that have assisted her to achieve promotion. In this time she’s also raised two sons, beaten cancer, completed two tertiary degrees and is currently completing Professional Honours. Debbie hopes that women will seize the developmental, promotional and educational opportunities that are available and make the most of them. She sees that newer members bring fresh ideas and contemporary knowledge that she hopes will shape the organisation into the future. While reluctant to nominate herself as a role model, it’s clear to see that she has embraced that philosophy and it has served her well. She can’t recall ever having worked for a female Sergeant during her career because there were so few when she was a Constable. But in recent years in Western District she’s seen a steady increase the number of many women promoted to Sergeant. “I think my experience of not having a female Sergeant as a role model is now unusual and for newer members it will be the norm to have female Sergeants. “The future is bright for a diverse workforce that is representative of the community it serves,” she said. 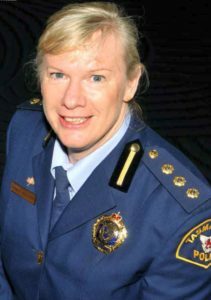 This page -- https://www.police.tas.gov.au/about-us/100-years-women-policing-tasmania-police/profiles/debbie-williams/ -- was last published on January 17, 2018 by the Department of Police, Fire and Emergency Management.